5. And most of all – have fun! 1. Dan and Margo Royer-Miller and their Circle of the Sun blog. 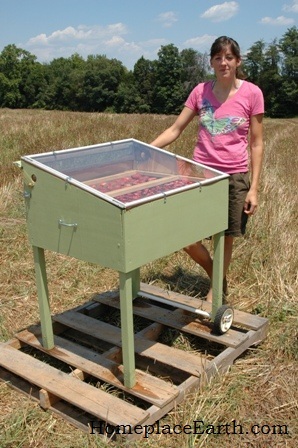 Dan and Margo spent years studying GROW BIOINTENSIVE Mini-farming at Ecology Action and Golden Rule Farm in California. Now they are in Ohio going it on their own. 2. Justin Cutter and Nick Runckle converted a truck into a traveling garden education center and have been touring the country powered by used veggie oil. You can follow them at www.compassgreenproject.org. 3. Every community needs a blog talking about local food and Richmond, VA has the Richmond Food Collective. You will enjoy what they write about, but beware, the pictures will make you hungry. 4. Contrary to what some of us might think, there’s more to life than food. When I was contemplating having a blog, my friend Vicki Welsh gave a talk to our quilt group about starting a blog. That was a great help to me–I literally took notes. Field Trips in Fiber is Vicki’s blog about adventures in quilting, hand dyed fabric, and fiber art. I’m bending the “rules” a bit here because I see Vicki has more than 200 followers, but take a look and have some fun. 5. I have some cotton that I have grown in 2011 and before. I’m ready to learn how to spin it and came across http://www.newenglandsimpleliving.com/spinningcottonhandspindle.htm which led me to the blog at www.newenglandsimpleliving.blogspot.com. I appreciate the cotton spinning tutorial. Have a look around her site. There are some interesting things there. I looked at many of my favorite websites to include, but they didn’t have blogs with them. I’m still getting used to communicating across the world on the internet. I prefer communicating face to face, but I’m open to learning new tricks. I have to admit, of these five blogs, except for the last one, I either know the people who write these blogs personally or we have mutual friends. My husband, who only follows my blog and that’s because he proofreads it, thinks that maybe I should get out more among the bloggers. I only joined Facebook when I was ready to start a blog because I knew that people liked to spread the word with Facebook. Daughter Betsy sat at my side and helped me through that experience. 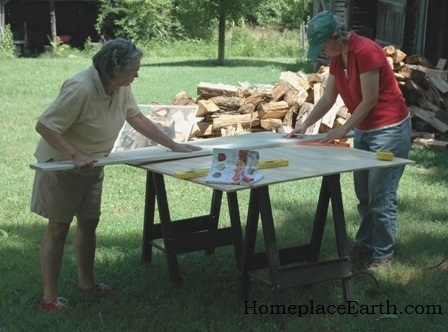 Don’t bother trying to friend me on Facebook, but you are welcome to sign on as a fan of Homeplace Earth, LLC. Musician Tim Barry, one of the members of the Homeplace Earth Gang (those in our garden plan video), has over 5,000 Facebook fans! 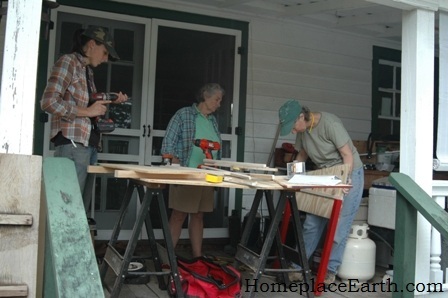 Tim has given me some pointers and some of his fans are Homeplace Earth fans, also. Gardening is the equalizer that brings so many different people together. One of the great things about teaching at the community college all those years is that I met so many diverse and wonderful people. Now I’m spending time meeting a larger community across the web. I enjoy your comments and ideas–it shows me that someone is listening. There are many great blogs out there. I made my picks from those that I know, that have great pictures, and that are current. Being old-school, books are still tops on my list for getting information, but blogs are a great way for people to connect and exchange ideas. I hope you enjoy my top five picks. 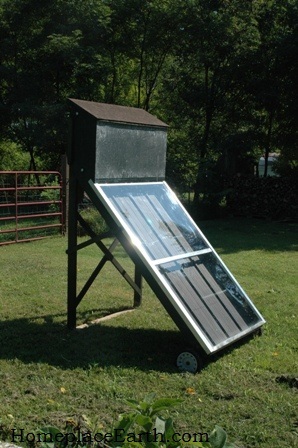 In my next post in two weeks (November 29, 2011) I’ll give you an update on the solar food dryers. See you then and enjoy your Thanksgiving! John Jeavons, Director of Ecology Action in California, will be presenting a 3-Day Workshop at the Pratt Institute on January 6-8, 2012. 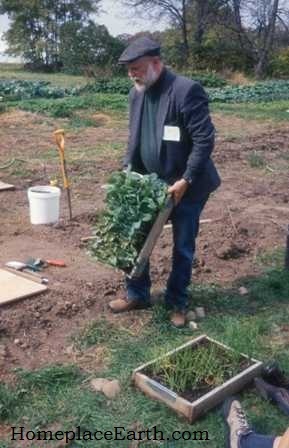 This workshop will focus on the GROW BIOINTENSIVE Sustainable Mini-farming methods developed by John and the Ecology Action staff over the past 40 years. You can find more information about this workshop at http://www.johnjeavons.info/. 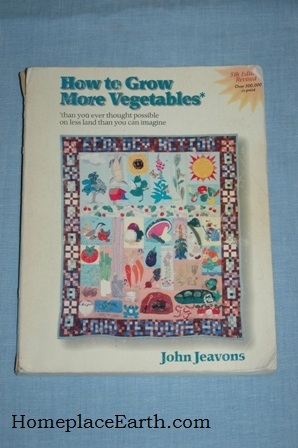 When I was learning to garden back in the 70’s, I had read John’s book How to Grow More Vegetables (HTGMV) along with all the other organic gardening information available at the time. I gained skills and knowledge over the years, first growing food to keep my family healthy, then expanding as a market gardener, growing food for my community. Since I was the only organic grower most people knew, I would get a lot of questions. In fact, the cooperative extension office used to refer people to me. Out of self defense, I began teaching through our county parks and recreation program in 1998 and at J. Sargeant Reynolds Community College (JSRCC) in Goochland, VA in 1999. Those classes are the Sustainable Agriculture Program offered there now. I left the college in 2010, but the classes continue with our daughter, Betsy Trice, as the instructor. When I began teaching, I was bringing together a lot of material from various sources. About that time I came across a copy of the 5th edition of HTGMV in a used bookstore. I was pleased to see the ongoing research on sustainability. Just what I needed for my classes! I took a new look at what John Jeavons was doing at Ecology Action and discovered their teacher certification program. All the better! The requirements are outlined in Ecology Action’s Booklet #30 which is available for download at www.growbiointensive.org or in print form from Bountiful Gardens catalog. 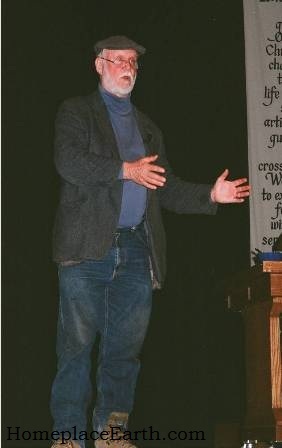 John Jeavons at 3 Day Workshop at Wilson College October, 2000. 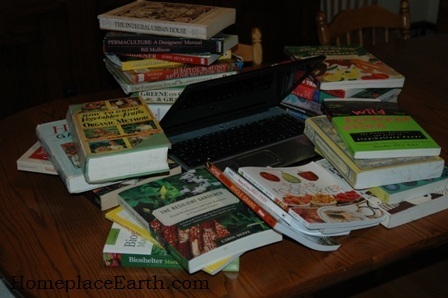 The first steps to becoming a GROW BIOINTENSIVE teacher are to attend a 3-Day Workshop and keep the appropriate records. I began keeping the records and attended the workshop in Pennsylvania in October 2000. At that workshop I became more aware of the world situation and began thinking more about my diet, crop choices, and how I could best feed back the soil. 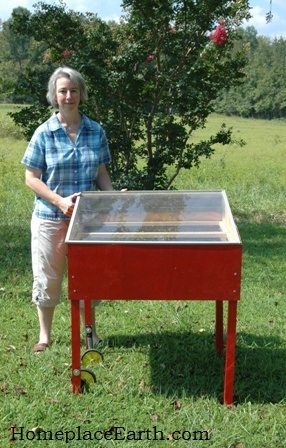 The GROW BIOINTENSIVE method includes eight aspects: 1. Deep soil preparation: 2. Compost; 3. Close plant spacing; 4. Open pollinated seeds; 5. Carbon and Calorie Crops; 6. Special Calorie Root Crops: 7. Companion planting and interplanting; and 8. The Whole System. This is exactly what I needed to be studying and teaching. Since 1992, I had been selling vegetables to local restaurants and through a small CSA, and in 1999 helped start our local farmers market. In those years I was growing A LOT of lettuce to sell, plus the usual vegetables. To replenish my garden beds I was using lots and lots of leaves for mulch. Our son, Jarod, has a lawn service and would bring me the leaves. By 2000 I was beginning to transition to cover cropping the beds over the winter, rather than layering them with leaves. 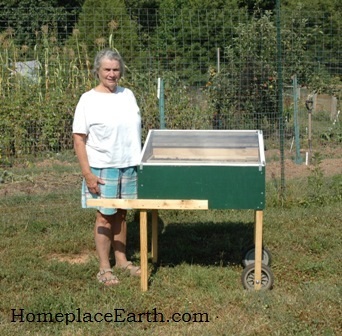 GROW BIOINTENSIVE offered guidelines for working cover crops and compost into my whole plan. I began re-thinking crop choices and in 2001 I grew more potatoes, butternut squash, onions, and garlic as market crops and less lettuce, cucumbers and other vegetables. Also, I was accepted into the teacher workshop at Ecology Action for July 2001 and would be gone for two weeks—one week for the workshop and an additional week of traveling. Not only did the potatoes, squash, and alliums fit that summer schedule better, I felt that I was offering my customers more power packed nutrition. By the end of the 2001 growing season, I realized I needed to step away from the markets and concentrate on teaching and researching. I felt by doing that, I could put more knowledgeable consumers and producers out there. Fall semester 2001 I had the opportunity to add a Growing for Market class, followed by Complete Diet Mini-farming in the spring. These classes were in addition to Introduction to Biointensive Mini-farming (spring) and Four Season Food Production (fall). In the years since, Ecology Action has kept researching and updating their information. February 7, 2012 is the release date for the 8th edition of HTGMV. Additional information can be found in the booklets available through Bountiful Gardens. In addition to what you see there now, Booklet #35 Low Rainfall Food Growing and Booklet #36 will be available in the 2012 catalog. 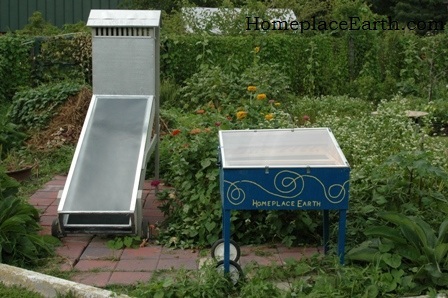 Booklet #36 “describes a basic experimental model for how to grow all your food, compost, and a modest income on as little as 3,300 sq. ft. at intermediate-level GROW BIOINTENSIVE Sustainable Mini-farming yields.” It has evolved from Booklet #14 and 25 years of additional experience. John offers the self-teaching video series GROW BIOINTENSIVE: a beginners guide at www.johnjeavons.info. After incorporating GROW BIOINTENSIVE in my work, I developed some teaching tools of my own–the videos. Our filmmaker son, Luke, made that possible. Cover Crops and Compost Crops IN Your Garden and Develop a Sustainable Vegetable Garden Plan are still part of the curriculum at JSRCC and are great for individual or small group learning. 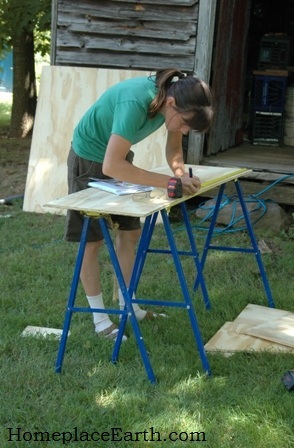 Becoming a certified GROW BIOINTENSIVE Sustainable Mini-farming teacher required a lot of disciplined record keeping. It didn’t come easily, all that record keeping. I was already pretty good at making a garden map showing all the crops for the year with rotations planned in. 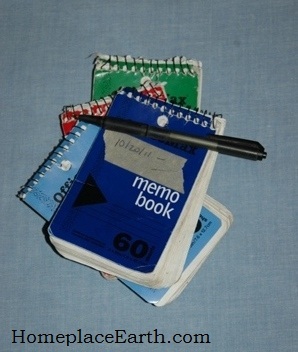 My in-the-garden method of data collection was to write everything in a small spiral notebook that I carried in my back pocket. I buy those in quantity at an office supply store. That was my chronological record and the map was my at-a-glance crop location and planting record. I would make a “proposed” map and an “actual” map, along with an “ammendments” map. For the more extensive records I needed to keep on my demonstration area for teacher certification I would transfer the information from the pocket notebooks to a data sheet for each crop, along with yield totals. That would all go on a yearly summary form. It does take some adjustment and discipline and you want to be careful not to take on more than you can care for, but the rewards are terrific. I have learned so much in the process. The more I learn, however, the more questions I have. There is always more to learn. If you want to learn more about GROW BIOINTENSIVE Sustainable Mini-farming and what John Jeavons is up to, I hope you can participate in a 3-Day Workshop. Besides the one in New York in January, he gives one each March and November at Ecology Action. 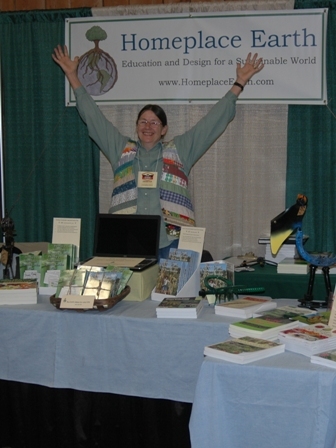 If you can’t do a three day workshop maybe you can catch him at the NOFA/MA Winter Conference (www.nofamass.org/conferences/winter/index.php ) on January 14, 2012 or the next day, January 15, at Mass Audubon’s Drumlin Farm. Pre-reading and pre-registration is required. It’s up to you. It’s your journey. There are exciting times ahead and we need as many people as possible to help lead others onto the sustainable food-growing path. First you have to learn to feed yourself, then you can better know how to feed others. You can begin on your own using all these teaching tools or become more involved with a workshop. Nevertheless, I hope you welcome the challenge and join us.